“Our industry does not respect tradition, it only respects innovation”, said Microsoft CEO Satya Nadella when he was appointed. His tenure has mostly been about exploring Microsoft’s future beyond Windows. 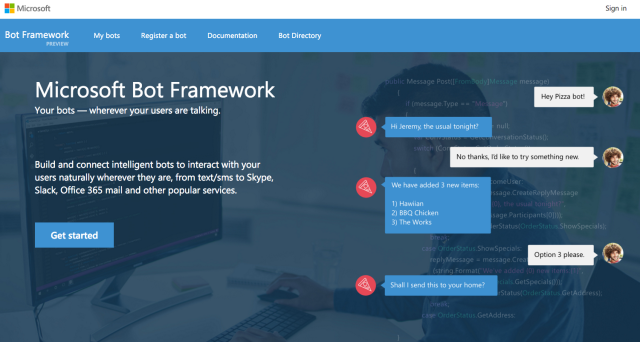 At the Build 2016 conference last week, he unveiled the company’s plans to bring the world of bots to “conversational platforms” – including Skype, Slack, Outlook, LINE, and more. To demonstrate this system, Microsoft assembled a chatbot for Domino’s, showing how a conversational interface could replace the standard online ordering forms (e.g. selecting from a drop down menu to choose your pizza toppings). According to Nadella, bots are the next big thing – and they make interacting with online businesses and services easier for users who don’t want to deal with the numerous mobile apps available today, or who are frustrated by navigating the endless sea of websites. Bots work better because you simply talk to them, using natural language. Sure we’ve heard about such chatbots before, but Microsoft wants to give the tools to build these bots to everyone. Yaay! Though Microsoft’s “Tay” bot was quite a nightmare, the company demonstrated how artificial intelligence applications built with Microsoft technology can be useful in the real world. Most impressive right now is Seeing AI, an application to help blind people navigate the world, built by a blind Microsoft software engineer named Saqib Shaikh. “The app can describe the general age and gender of the people around me and what their emotions are, which is incredible,” Shaikh said. In another scene, Shaikh uses the smartphone app in a restaurant to find out what’s on the menu. “Years ago, this was science fiction. I never thought it would be something you could actually do, but artificial intelligence is improving at an ever faster rate,” he said. Microsoft will help power these programs by providing what it calls “cognitive micro services” — little scoops of prepackaged intelligence that give bots the ability to understand natural language, for example, or analyze and label images. We’re very excited by the idea of being able to build our own little bot! How bout you?